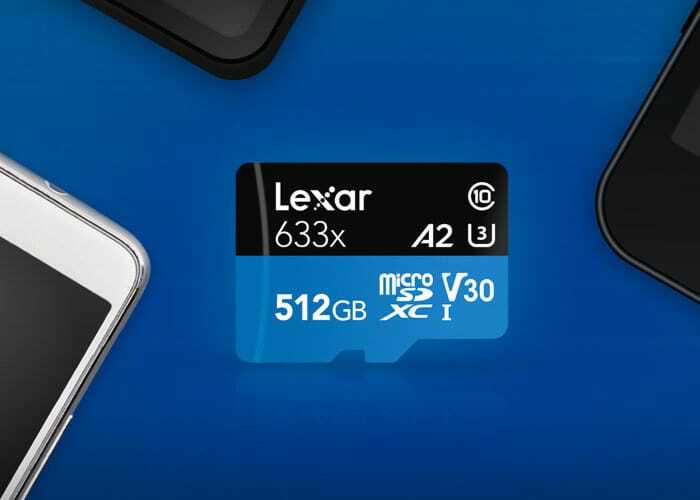 This week Lexar has unveiled a new addition to its range of flash memory microSD cards announcing the imminent availability of the new 512GB Lexar High-Performance 633x microSDXC UHS-I card, which certified as Application Performance Class 2 (A2). Currently the 512GB Lexar 633x microSDXC card is the largest capacity A2 microSD card on the market and is priced at $300 and is speed rated at Class 10, with leverage UHS-I technology to deliver a transfer speed up to 100MB/s (633x). A2 allows Users to experience higher minimum random write speed of 2000 IOPS and minimum read speed of 4000 IOPS during app intensive transfers. “As smartphones integrate more and more into our busy lives, we’re relying on them to do more than ever. Having the world’s largest A2 microSD card will aptly meet the demands of even the most intense power user with its high-performance and high-storage capacities. We’re proud to be part of the digital revolution in continuing to advance the trusted format,” said Joel Boquiren, Director of Global Marketing. The 512GB Lexar High-Performance 633x microSDXC UHS-I card will be available to purchase in the next few days from worldwide retail partners. The mean time for more details jump over to the official Lexar website via the link below.